For people like me who likes to read books inside Japanese trains, 7-inch is the maximum size for an ebook reader that can be held and operated comfortably with just one hand. The 9.7-inch iPad and other similarly sized e-book readers are just too big. 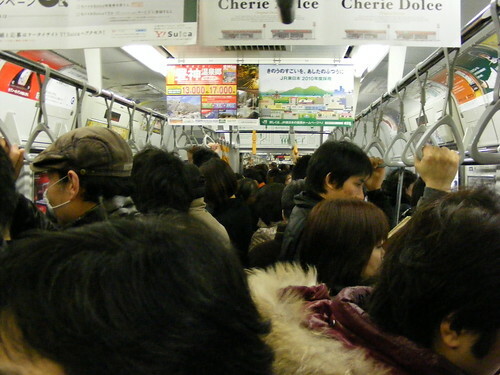 In Japan where trains get too crowded especially during rush hours, it is highly likely that you have to stand inside trains and use one of your hands to hold on to straps or handrails, leaving you with only one hand available to carry other things. Even if you can balance yourself and not depend on straps, it is very likely that you won't able to lift a reading material using both arms without elbowing people around you. In terms of weight, 7-inch devices are also ideal compared to bigger models. Most 7-inch devices are lighter than those that are sized 10 inches or above. For example, the 7-inch Samsung Galaxy Tab is about half the weight of the 680-gram iPad. When holding for extended periods of time, the Galaxy Tab will be less strenuous than the iPad. Therefore, for reading ebooks inside crowded trains, smaller is better - but not too small. The 3.5-inch display of iPhone and other similarly sized devices are too small to effectively display most books. Some e-book readers have Text Reflow and Zoom features that let you wrap sentences and enlarge fonts but when the material you're reading has a fixed format or is full of graphic elements, a small display becomes too inconvenient even with these features. By the way, I'm not against the iPad, the iPhone, and other non-7-inch devices. I think they are great devices and each of them has its unique capabilities and use cases. But for reading books inside crowded trains, which I personally do on a daily basis, nothing beats a 7-inch.